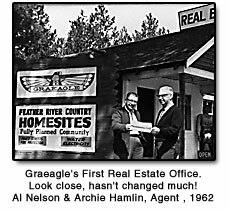 Selling Graeagle real estate is a family tradition that dates back to the year 1962, when Harvey West, Jr. created a beautiful subdivision in Graeagle among the fragrant pine and blue lupine. Then in 1968, he developed the Graeagle Meadows Golf Course, an 18-hole, par 72 Championship course. Shortly thereafter, the Graeagle Meadows condominium project was developed, and eventually came six subdivisions, public tennis courts and the new town center. In all, the development of Graeagle has been over a 50-year process that is still very much in the making. The West family has ultimately developed one of the most well thought out master planned communities found anywhere in the High Sierra.